My Hair Extensions Feel Dry, What Can I Do? Hair extensions are a wonderful and versatile way to add volume and length to your hair for any occasion. But what a lot of people don’t realise is that you cannot treat them like you would your own hair. They need TLC to keep them in tip top condition. One major problem that many people have with hair extensions is that they become dry – quickly! To those that love them, this can be a stressful problem, but more importantly a huge disappointment. There are many factors as to why extensions become dry and frizzy, and even unattractive, including; overexposure to heated tools, over processing (including hair dye), environmental damage, seawater and chlorine exposure, hard water, poor quality materials, plus many, many more. The list truly is endless. Here at Hairapeutix, dry hair extensions are our number one enemy, so we thought we would explain how you can (at home) fix this problem. We’ll talk about the best treatment for dry hair extensions, and how you can prevent dryness from setting in on your luscious locks. So if you would rather have silky soft and easy to manage hair and not dry, brittle hair extensions, then keep on reading to find out more. Have your hair extensions become dry? Fear not, you’re not the only one suffering with this. Dry extensions are an extremely common issue but one that can be dealt with, easily. But first let’s take a look at why your extensions have become dry. Everyone has sebaceous glands all over their body and of course in their scalp. These sebaceous glands produce Sebum, a natural oil that is vital at naturally conditioning your hair and protecting it. When our own hair becomes dry, the scalp compensates by over producing Sebum in order to keep the hair hydrated, soft and supple. Sadly, when you have hair extensions, these aren’t granted access to the natural oil which would keep them soft, as they don’t have any sebaceous glands of their own. So straight away they are predisposed to becoming dry from the start. Add on to this washing, and heat styling etc, the extensions will undoubtedly become extremely dry. If the care hasn’t started from when you have them applied to your hair, or if it isn’t addressed as soon as they start to become dry, they will continue to dry out, become brittle, and unmanageable. We understand the frustration this problem can cause, but there are ways of treating and fixing the problem. By adding a treatment that mimics the work of Sebum, the natural oil your scalp produces, this will infuse your hair extensions with the thirst quenching moisture, and conditioning properties that they so desperately need. Only natural oils will be able to do this task, as they are able to penetrate the hair shaft, unlike man made conditioners and serums. Why? Well, conditioners and serums contain silicones that are designed to only sit on top of the hair, which ultimately causes damage in the long run. Whereas natural oils can work their magic permeating and nourishing each and every hair strand. So as previously mentioned, hair extensions are more prone to becoming dry, because they aren’t attached sebaceous glands. This means there is no Sebum to help naturally keep them soft, supple and protected. So you need to take extra care of them, more so than you would with your natural hair. Start hydrating your extensions at least once a week to give them what they would naturally get from Sebum, which would also protect them too. Our preshampoo treatment is the perfect product and best treatment for dry hair extensions, to help keep them in great condition and looking the best they can. When using heat styling tools including, hair dryers, straighteners and curling tongs, apply heat protection spray. For more information and tips on drying your hair extensions, be sure to check out our handy guide. 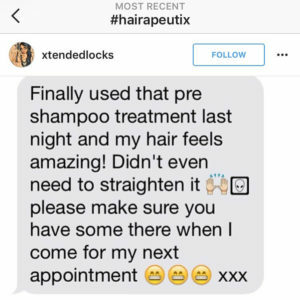 Here at Hairapeutix we’ve developed the very best treatment that not only your natural hair needs, but more importantly your hair extensions. We’ve spent a lot of time researching, and ploughed in thought and effort into developing this treatment, which is free from silicones, parabens and all other chemical nasties. Making this an all natural treatment to help fix your dry hair extension woes. Our treatment is a unique combination of natural oils, including coconut oil, olive oil, avocado oil, almond oil and amla oil, all of which help to restore the quality of hair, leaving it silky soft. Enjoy waving goodbye to those dry hair extensions! Step 1. Simply apply our pre shampoo treatment to dry hair extensions BEFORE you shower. We recommend to leave the treatment on overnight, to allow the formula to fully absorb into the hair’s shaft. If time isn’t on your side, don’t worry you can use this treatment for anywhere between 30-60 minutes. The longer you can leave it on the better, but even 30 mins will work wonders. Step 2. When you wake up in the morning (or when the 30-60 minutes is up), simply wash out the treatment with your normal shampoo and conditioner and style as normal. To keep your natural hair and hair extensions hydrated to the level they need to be, we suggest doing this treatment once a week. This will help to enhance the longevity and health of your hair extensions. You’ll also be able to revel in your gorgeous, soft, shiny hair that you’ve always wanted and deserve, that you’ll be sure to turn heads with. (You can thank us later!). So if you’ve had enough of your dry hair extensions getting you down, grab our Pre-Shampoo Treatment today for that good hair day tomorrow! 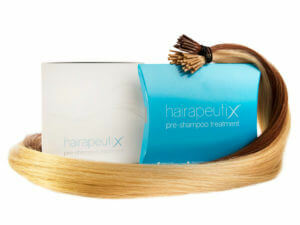 I Don’t Wear Hair Extensions, Can I Use Hairapeutix Pre Poo Treatment?